I wrote a simple Android app to show the A,B,C schedule shifts for Glendale Fire Department, then added Rancho Santa Fe (Kelly Calendar) and Los Angeles City. v. 1.0.5 fixes daylight savings bug. v. 1.0.6 changed to work forever, including accounting for leap years. Should continue working well through the year 2999.
v.1.3.1 – Pro and Free versions released – with options! Why does August only show 39 days & November 29? 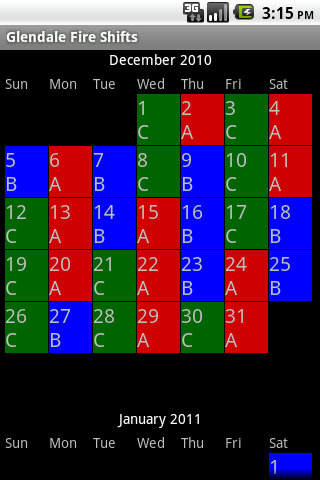 Shifts still work out ok but just miss out the 2 missing days! Oops, that should have been 30 days, sorry! Looking for a shift calendar that would work for our department. I’ve attached the above link which shows our 2011 calendar in pdf. Is this something that you could work with? Sure thing Dave, I’ll have something for you in the next couple days. I am from Overland Park, KS fire and I can’t seem to locate the fire shift calendar on the market. I tried using by barcode scanner from the apps online website but apparently it wont work on my android phone. Any suggestions. Other members of my fire department with android phones have already downloaded the app and appears to be fine, however my app market doesn’t even recognize it! Help!! Turns out, I had it set for minimum Android version 1.6. I changed the requirement on your version to be 1.5. Future versions will need at least 1.6 to do calendar syncing. Can you make a “United Phoenix Fire Fighter L-493” and add a link to our website? Its up in the market now. I can’t find anything that corresponds with my husband’s 48/96 schedule. He works for the Modesto Fire Department. Is there an android app for that shift schedule? Ok, we just switched to a 48/72 this year consisting of 7 groups. Will any of these work for us? Can you make an option on the calendar to be able to select your shift and group and let it hi light all the off days and Kelly days? It would be easier to read if there were fewer colors and let if focus more on the individual users schedule. Or have an option to select between highlighting the on days instead for user selection. Just an idea, Thanks. Forgot to add that the un highlighted days may be white for ease of use. Could you do a custom calendar for our work schedule? We share the same schedule as Shreveport Fire Dept. 1on, 1off, 1on, 1off, 1on, 1off, 1on, 3off, 1on, 1off, 1on, 2off, 1on, 5off. Her starting date this year was 1/04/11. I have an android phone and would love to be able to keep the schedule on it. Thanks in advance for your help and God bless you. Did you ever get this schedule posted for use? I work this same schedule and couldn’t find it on any site that I have searched so far. Shift Type #50 lines up for this one. If you are also in Richmond, VA your offset should be “None.” If you are in a different city, email me your July schedule at monica@fireshifts.com, and I can help you find the correct offset. The A shift last day is today, then Feb 24 is B shift, Feb 25 C and the A shift comes back to work March 2. How about a Fire Shift for Ventura County? I have the FireShift Pro. I made a few mods to make it “fit” our work schedule. I’m still trying to figure out how to add our paydays to the schedule. Thanks for any help! Any chance you can get Toronto/Mississauga’s shift schedule up there? D (day 8) / C (night 8). The cycle then repeats with A on days and D on nights, as in Day 1. Can your app accommodate this? Right now, the best option would be to use the AABBCCDD schedule #20. Offset your schedule until your AA lines up with your Days, and B’s with your nights, then change the labels from A to Day and B to Night. Set C and D as Blank/Black or grey and it should work for you. It will only show your schedule, and not any of the others. So if you are on C shift, just shift your offset over until you AA lines up with your Days. Everything should line up from then on. Also is there a way to put any way to put a n1-9 starting Sept.1 as n1 sept 4as n2 etc…. How about a rotating 3 week schedule: Tues/Thursday, mon/wed/fri, Sunday/following sat…wed is FF A kelley day, thurs is FF B kelley, and fri is lieut kelley….I can self u a copy of it if it would make it easier. Let me know thanks! Which schedule would coordinate with LA County? Can you do a shift calender for FDNY EMS? We work 5 on 2 off 5 on 3 off 8 hr shifts. Work for the Metro Fire Brigade, Melbourne Australia. Looking for a 4 on 4 off schedule with the 4 on being two days and then 2 nights. Any ideas? Try using #47. I added it in recently. Week it will be Tuesday then a Wednesday etc. I added in that shift. Try using #47 and see if that fits for you. Try #17 ABABCDCD it should work for your On/Off/On/Off 5 days. Use schedule type #10, AACCBB, then offset it to 5 days. Should line up just fine. Using shift type #47 should do the trick for you. I can not set the offset for your app to L. A.; City Fire’s schedule – can you send me the settings? Having trouble setting a repeating schedule for kelly days in my google calender. My department works 24/48 and kelly every 19 shifts, or every 57 days. Any suggestions on how I can set that to repeat in my google calender so I can sync it to the app? Would like to see calendar go out at least 18 months, 24 months would be better. Cannot use the calendar when it comes to vacation selection time in November (for following year) because calendar stops in October. Fire Shifts Pro User. Fire Shifts Pro should currently show through February 2013. If yours is only showing through October, something is wrong. As for a full 18 or 24 months, its in its planning stage to allow this. How’s the update coming? Vacation picks start in November and I still will not be able to view all of 2013. I work 12 hr shifts 6a to 6p Mon thru Thursday off Friday thru Sun. B shift works Tuesday thru Friday 6a-6p off Sat thru Monday non rotating. Any suggestions. Great app. Would like to see a full-size widget available. I also would like to be able to sync back to Google. So I can see my fire schedule in the Google calendar. It is cumbersome to add all work days into Google, then use Code provided for Vacation/kelly, ect. which is nice, but would like if didn’t have to input work days into google, that it would just sync and be done. Thanks for the suggestions. In the future, we’ll try to develop it to sync both ways. Sorry, forgot to add. The weeks above start on a Monday, not Sunday. Can’t really get this to sync with mine. Today is May 3 and I work 24/48. Need to start it on the 5th of May. How do I do this? Use the Offset feature in the Preferences menu to shift the calendar forward until it lines up for you. I downloaded the shift calender but how do I change it fro 24/48 to 24/72. Select “Menu” on the Android > Preferences > Shift Type > #3. Here is a Tutorial on how to set it up as well. my shift calendar fire shift pro will not work on my htc evo lte. It worked fine on my old evo is there a fix for it? How’s the update going on pushing the calendar out 18-24 months? This feature is really needed. Can you add the DuPont schedule with a 7 day long change every month. Is this available for kindle fire hd 8.9 inch? Is there a 4 on, 4 off, 4 on, 3 off schedule? A/C, B/D , B/D, A/C, A/C, B/D, B/D, B/D, A/C, A/C, B/D, B/D, A/C, A/C: then repeat. I work a 2 week rotation.. 16 hr workday.. Monday, weds, fri week 1, then tue and thurs next week. How can I show this rotation?.. and .. show my husbands 24/48 shifts?… help! but for some reason my phone crashed and after down loading your app again it wont stay set if i close it ??? I was wondering if you have a schedule for 3 days on 2 off 3 on 6 off? If not, is there a way to build a calender? My husband and I are both in the fire service (I dispatch and he is a ff/paramedic). His shifts are 24/48 rotation and mine are 24/72. We have been looking for a calendar that would allow us to overlap our schedules – that is show both rotations on one screen together so that we can plan better for our time off and that time when we will both be at work for 24 hours. He selects vacation in September each year and plans around our family schedule a year in advance (gets pretty interesting) Also, is there a feature to this program (I haven’t read all your material yet) that allows us to put in vacation and Kelly days? Ideally, we would be able to print a full year at a time, but I realize this probably isn’t the app for that function. Currently we use a simple Google calendar and put in both schedules as appointments. We work a 3 shift, 2 split system- Black Red Gold, with an A and B split. Assigned shift is on every 6th day. Which one would work best, or how can I set up. Thanks in advance. I use pattern 47 as these are the shifts I do. “C” is off days but there is no letter to select for this so I leave it blank. “D” has off but there is no AA BB DDDD option.Great app though, cheers! I’m trying to set this app up for my rotation and having difficulty. I’ve used it before…. Give shift type 5 or 6 a try. 10,10,10000. It should match up with your type of schedule. Then just change the offset around until it fits your schedule perfectly. Looking to find a schedule that works with 4on4 off with 4 platons (ABCD) can only find that format with 3 platoons…Any suggestions? We work 28 days rotation, 24hrs monday – friday and 48 hrs at weekends. Do you have a schedule that works for us? Can you tell me what is the most common Fire Dept shift schedule in the US. Recently, a politician has been stating that the vast majority fire departments use the 24 /48. Although I have found many departments use this schedule it does not seem to be the “vast majority”. That is a good question. I don’t, at the moment, keep stats on which shift is the most popular by number of users. But I do have the number of cities that have contacted me and which shift types they use. I would say the 10,10,10000 schedule is the most popular. Listen. I work a schedule that’s just like the city of Fayetteville fire Depts. here in North Carolina. Which schedule would I choose? Hi, how come you can change colours on an android system but on iPhone it just says more colours coming soon. Hi put 23,24,25 &26th in calendar but on pro it puts *on 23rd 25th 26th &27th? Any ideas why. I use number 47 pattern and it works fine on all the rest. I couldn’t find one to fit my new schedule. 1 on, 1 off, 1 on, 1 off, 1 on, 4 off with A,B, and C shifts. Also, I’m using an iPhone if that makes any difference. I have a galaxy s6 edge +. Downloaded pro, can’t get the menu to pull up to sync with my calendar. Holding the button on the bottom left does nothing. Has this been remedied? Or do I need to go ahead and refund? Got this app because I can put events on the calendar. Is there any way you could make a 7 on 7 off shift for A/B shift on one, and C/D on the other? We work 12 hr shifts so there’s 2 shifts per day. My department works the following schedule and I am unable to find a shift schedule to fit it, any help would be appreciated. Any idea when updates for IPhone will be happening? It would be nice to modify colours etc. Thanks. My department works a 12 hour shift, 2 on/3 off, with a long week every 4th week. There are 4 teams, ABCD. A days/B nights, C days/D nights. I have tried using a number of different options in your app but cannot find the one that accommodates this schedule. Can you offer some insight? I can send you a copy of the calendar for you to evaluate. I work nova schedule 24 on 24 of 24 on 24 off 24 on 4 days off. I’m trying to load this calendar to work for our schedule. It went black. What’s up? Love this app. iOS not supporting and I need this app to work! I need this app to work! Any way of making my schedule show up on my Google calendar? I get the sync feature, but I’d love to have my shifts show up on my Google calendar. Mine is an ABCD group chart with every 25th day being an open group.. so 1-24 would be ABCD 25th would be the open group then 26th starts the next 24 days of ABCD with 25th being open again ..
For instance my group is B i was in on Monday my next day in is Fri.